An inspiring woman is an attractive woman. That’s what my mother used to tell me every time I wanted to do something unoriginal on a Friday night like grab pasta at the local Olive Garden and then see a film afterwards at the cinema which probably was some sequel of the Fast and the Furious. Her idea of an “inspiring” Friday night meant that I would leave school at 2pm, head home to pack a weekend bag, drive to the airport without a plane ticket and once arrived, choose a random place to go for a mini-weekend away. Wouldn’t that be the life at age sixteen? My mother taught me many things throughout the years, but I would say in particular, one of my favorite things was learning how to treasure hunt. 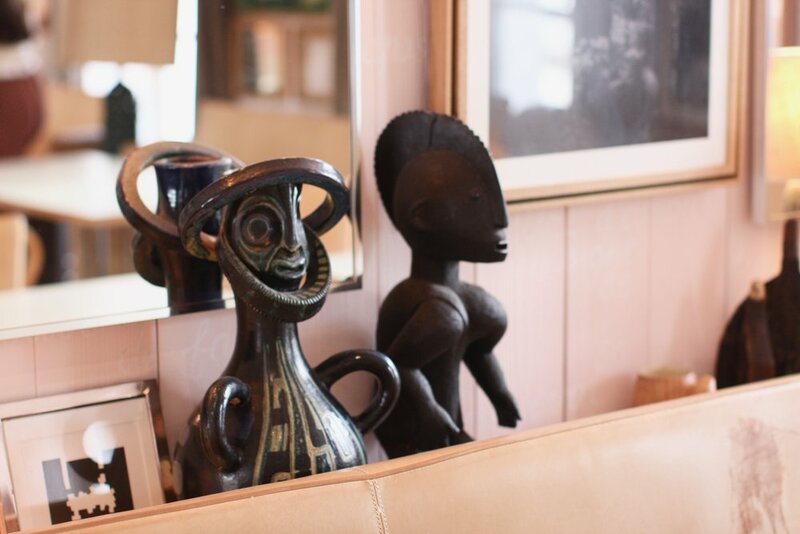 Although I could spend the time going down the list of all the things I like to collect, I particularly find excitement in scoring mid-century modern antiques, vintage outfits, watches, vintage designer accessories and vinyl records. That is why every time I visit Paris, The Marché aux Puces de Saint-Ouen is always on my list of places to go. 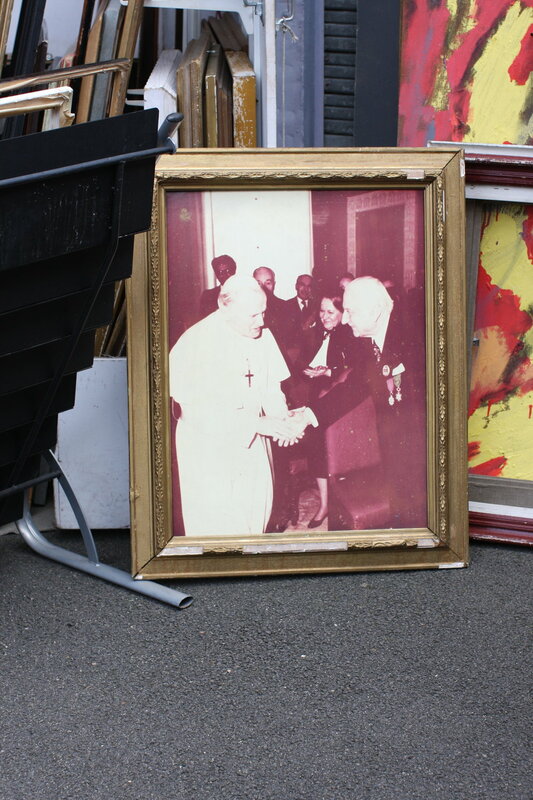 Located just north of the 18th Arrondissement, a few blocks away from the Sacre Coeur Basilica, Les Puces is known as one of the largest Flea Markets in the world. To get there, take a ride on the Metro line 4 to the Porte de Clignancourt in the 18th and it’s a short 10-minute walk through a somewhat dodgy bazaar filled with cheap clothes, foreign men trying to sell you fake Gucci and randoms trying to steal your cell phone. You’ll end up northwest along the Rue des Rosiers on the left (the road off of which all the markets extend) with some amazing antique stores that are definitely worth exploring. You can also get there by taking the Metro line 13 to Garibaldi and walking through Saint-Ouen to the other end of the street. If you get hungry, the best place to eat is a rather charming two-level brasserie designed by Philippe Starck called Ma Cocotte. Opened in 2012, it’s became quite the spot to dine offering everything from foie gras to boeuf and is open for lunch and dinner during the week, even when the flea market is closed. For other options for lunch or a small snack, La Buvette des Tartes Kluger is in the large Habitat courtyard and offers tons of sweet treats that can be eaten on picnic tables outside. Also, if you’re looking to stay in a hotel near Saint-Ouen, hotelier Cyril Aouizerate of Mama Shelter hotel in Belleville in the 20th Arrondissement invested over 40 million euros in a new hotel that opened in 2016 called M.O.B. 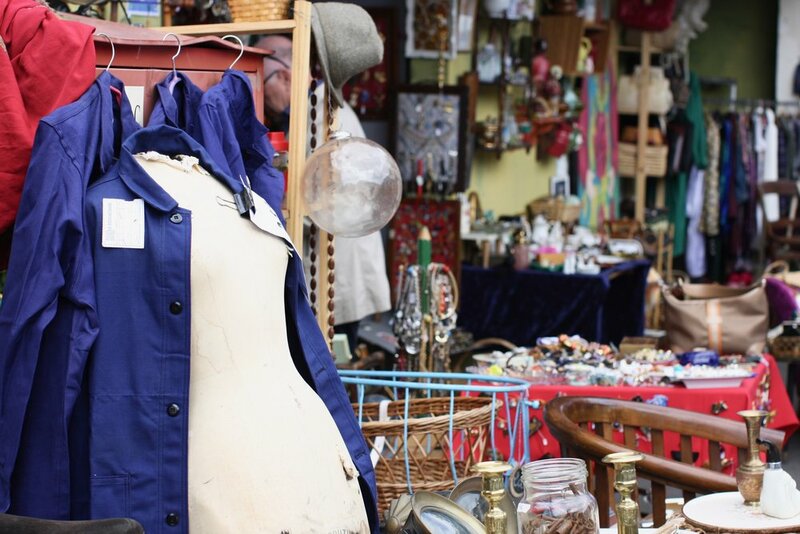 Below I tried to outline my completely non-exhaustive guide to my top three favorite marchés in one of the best flea markets of Europe, but I can't stress how important it is just to spend the day getting lost on your own journey. 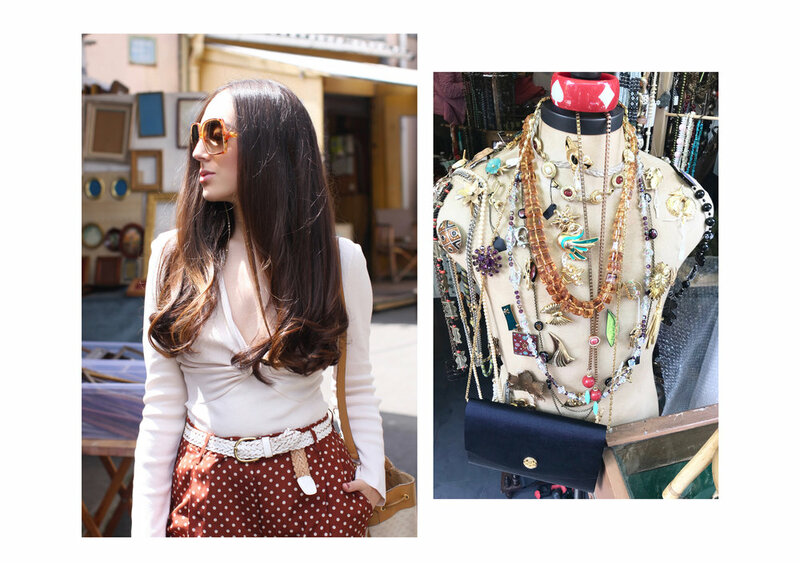 V E R N A I S O N : Off Rue des Rosiers, make a right into the Marché Vernaison, which is relatively reasonably priced and you can find everything from vintage Gucci accessories to vintage Jackie O wedding dresses. Au Grenier de Lucie has jewellery from designers, such as Chanel, Dior, Lanvin and Schiaparelli. Always attempting to be some sort of arbiter of style, my mom taught me how to collect Chanel gripoix vintage jewelry at a young age. For those of you that don’t know, Chanel gripoix is some of the most coveted vintage jewelry in the world. Chanel's costume jewelry such as the stylized camellia designed in the eighties by Gripoix is very popular. You can find several one-of-a-kind pieces at Au Grenier de Lucie from Chanel gripoix and perfect-condition schiaparelli cuffs. The owners, Jason and Heidi Ellis gave up their jobs as sports coaches, sold their London home to move to Paris and opened up a vintage jewelry and accessories shop. Also stop by Paul Maurel gallery for authentic antique posters dated from the beginning of the twentieth century with the Art Nouveau period and the 1930's Art Deco to including new graphics beginning from just after the end of World War II and continuing through to the present. I also love finding pieces for the house here and presents for friends! S E R P E T T E : The Marché Paul Bert Serpette will make you feel like you have stepped back into time. It is the market where ALL the insiders go, as it has amazing mid-century design wares. It’s my personal favorite and just so happens to be the most expensive part of the market because the curation is built of those of high demand. My favorite furniture designers are Jean Royère, Pierre Cardin, and Pierre Pauli. Also in Marché Paul Bert Serpette, you can find the perfect vintage Hermès scarves starting at 160 euros at Le Monde du Voyage. To find preserved Louis Vuitton trunks, head to Helen and Alain Zisul. Just in the past few years, about 50 shops have opened in Paul-Bert-Serpette with many of them being a new, younger generation of dealers. Mid-Century furniture, brass lighting and decorative arts that are modern, trendy, but rather pricey. I really love natural materials like wood, stones and leather for their sensuality. If you understand these basic principles and what to look for with structure and design, you can not have bad taste. Habitat (EU furniture designer) transformed a spacious courtyard of old ateliers and warehouses on Rue des Rosiers across the street from Paul-Bert-Serpette into soaring, deluxe spaces that resemble small, curated little galleries. There on the ground floor of the Steinitz workshops, you can find Mademoiselle Steinitz, which brings together famous Parisian antique dealers for a rare selection of furniture, period time items and vintage haute couture. D A U P H I N E : Marché Dauphine is filled with old photographs and postcards. You can take an escalator and call on Philippe Rault just inside the entrance where for 15 euros, you can likely walk away with a perfect gift. The flea also is carries a number of vintage watches, which I Iove to wear and stack on one wrist. Check out Roman Rea’s in Marché Dauphine. Speaking of watches, did you know that Patek Philipe introduced the first wrist watch in 1868, and Cartier popularized it. My favorite Patek watch is the Calatrava in rose gold and my favorite Cartier watch is the Ballon Bleu in gold. The first practical watch that was created was the Tank and Santos watch by Cartier, which was used by both men and women for sport and business. Omega watches were the choice of Nasa and the Speedmaster was actually the first watch on the moon. Omega also happened to gain popularity, thanks to James Bond. Then there is Rolex, who invented the first water resistant wristwatch and happens to still be the largest watch brand in the world today. So to be honest, you can't really go wrong with one of these brands and for the most part, like fine wine, they get better with age. You can also find amazing photo books that can be used as gifts! They also have amazing bargains in the in the main Dauphine area. In Marché Dauphine, there is also a super large Verner Panton spaceship for sale alongside some of the best space-age furniture. One of my favorite artists, Pablo Picasso, used the markets to find inspiration and Woody Allen’s 2011, Midnight in Paris film sent its characters here searching for hidden treasures where they discussed the characters passion for the "Lost Generation". If you end up going, shoot me note at coco@cocozaza.com as I would love to hear about all the wonderful things that you acquired that you will likely have for many years to come. Hours are Saturday 9 a.m. to 6 p.m., Sunday 10 a.m. to 6 p.m., Monday 11 a.m. to 5 p.m. For more information, visit www­.marcheauxpuces-saintouen­.com. The best days to go are Friday and Sunday at 9:00 a.m.